This article will focus on the various UPS Package options and will help store owners understand UPS box-packaging calculations better. As a result, they will be able to find the cheapest and smartest way to ship products to their customers across the globe using the WooCommerce UPS Shipping plugin. Shipping customer’s orders have become one of the most important aspects for WooCommerce store owners for quite some time now. Among all other processes involved in shipping, product packaging still seems a bit confusing for some store owners. This has made it very difficult for them to determine the accurate package and shipping cost based on their business needs. The basic aspect of packaging is the dimensions of the parcel. In the case of manual packaging, the idea is to manually measure the dimensions. Only then will the package be ready for shipment in a box. The other aspect is the weight of the whole package, including the box. Most of the shipping services work on the basis of weight. They have their charges based on the package weight. So you can imagine the pain of manually measuring the dimensions of the package and then putting it in a suitable box. And when you thought that the work is done, then again you have to weigh the whole parcel. So overall, the idea of manual packing is like a nightmare to all the online store owners. But in WordPress, managing a WooCommerce shipping is an easy task. Especially with our WooCommerce UPS Shipping plugin. It provides store owners with all the shipping methods offered by UPS, along with automatic rate calculations and label generation. To further understand the concept of packaging and shipping, first, let us see how the shipping charges are actually calculated in UPS. How the charges are calculated..? The UPS parcel is based on the dimensions (length, breadth, height). Hence the package is prepared on the basis of volume (Length*Breadth*Height). The box that will be able to accommodate the required volume, will be used for shipping. Suppose there are multiple items that need packing, either that box will be used which can contain 100% of all the items or the one which can contain the highest percentage of the item. In the second case, if say there are two boxes specified both of which are not able to contain the products, that one will be chosen which contains more percentage of the products. And after that, the same process will be repeated again. Suppose there is a single product that is ready for shipping. But unfortunately, no custom box is big enough to accommodate it, then that item will be shipped individually. These are the basis of package charging. But sometimes store owners may want to add additional charges or handling charges based on product dimensions and weight. 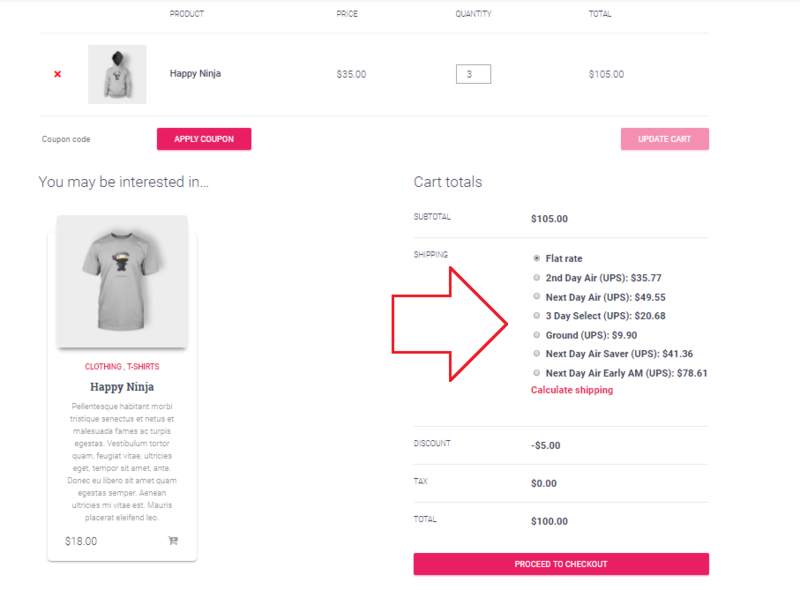 The WooCommerce UPS Shipping plugin lets store owners add additional handling charges from within the store. All you need to do is add these charges while selecting the UPS shipping methods. Here you can add the exact value of the charges that you want customers to pay for a shipping service. Here you can add the percentage that the customers will have to pay based on their selected shipping service. The customers get the final shipping charges from UPS API. The customers can see these charges on either cart or checkout page. Now since you have understood the essence of the shipping charges calculation, here is a live scenario where a smart decision on the store owner’s part allowed his customers to save a lot of money over shipping. An online Cloth House, set up in the US, California, wants to deliver products to its customers domestically. The store owner, Steve, has opted for domestic shipping methods such as 2nd Day Air, Next Day Air, Day Select, Next Day Air Saver, Next Day Air Early AM, etc. Being a medium scale business owner, he wants his customers to be happy with the fast delivery options. So let us see how he configured WooCommerce UPS Shipping plugin to suit his daily requirements. So when an order came for three products, his shipping got carried away in the following manner. These screenshots will demonstrate how the delivery charges changed based on the parcel methods that he used. It is to be noted that this was because Steve had opted for Individual Delivery for every item. But Steve had one more way to decrease the shipping charges for his customers. Box Packaging saves a lot of money when it comes to multiple products. So all Steve had to do was configure the WooCommerce UPS Shipping plugin and add a Custom Delivery Box which can contain three products. So as you can see, the delivery charges are almost half and in some cases one-third of the earlier charges. This can be a game-changer, especially for small and medium business owners. If they know how the delivery charges are calculated and how they can configure UPS packaging to decrease the shipping charges drastically. This was all about how the charges are calculated and how smartly you can optimize the shipping charges using WooCommerce UPS Shipping plugin. Following is an insight on some standard UPS parameters and features, that you can configure using the plugin in your WooCommerce store. UPS shipping services are subjected to the weight and physical dimensions of the package. Based on your region you can choose the unit of the above-mentioned parameters. 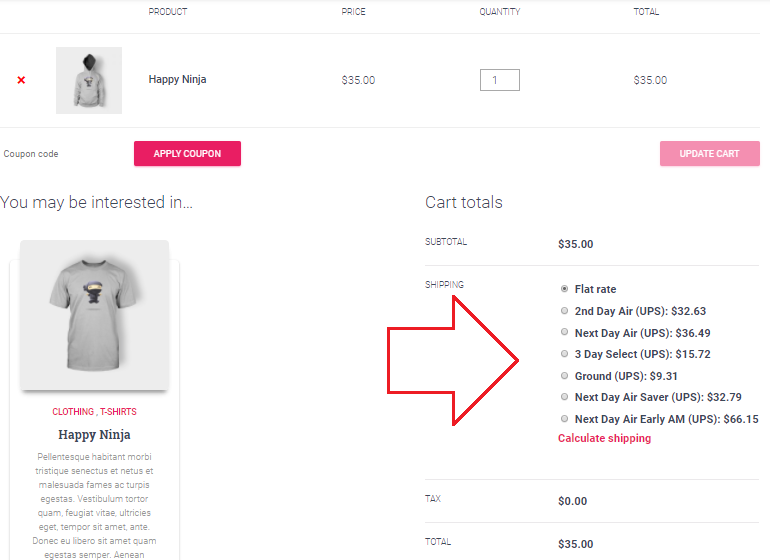 You can manually select the unit using WooCommerce UPS Shipping plugin. Since you have decided the units of both Weight and Dimensions, let’s see which packaging method to use based on some scenarios. WooCommerce UPS Shipping plugin provides three parcel packaging methods which you can choose from the settings. Using this method one or more than one items can be packed separately. Mostly the weight and dimensions are used to calculate the total charges, which are fetched from the UPS API. If the store owner doesn’t specify any parcel method then automatically the rates are calculated by this method. This method is helpful if you want to pack the items in boxes. This method uses the box dimensions and maximum package weight that can be shipped in a particular box. If a box is not able to accommodate the items, then another box is used and the charges are added to the total shipping cost. With this method, there are no limits on quantity and weight of the individual item. The defined weight of the total package will determine the number of boxes used. If the weight exceeds the specified one, another box will be used for packaging. The weight-based shipping cost will be available to the customers in the cart. As discussed in the earlier section, with the help of this method WooCommerce store owners can pack individual or grouped items together in boxes. By default, the WooCommerce UPS Shipping plugin provides all the UPS packaging options directly from its interface. You can choose any of the options from the settings of the plugin. All these box options have predefined guidelines and limitations in terms of weight and dimensions. Besides, they also have a default amount that is added to the total charges, respectively. But the drawback of these options is that sometimes these options prove to be too costly. The reason being their default fixed dimensions and weight limitations. With the help of the WooCommerce UPS Shipping plugin, the store owners can choose their custom box dimensions and weight limits. They can add these custom boxes and modify the weight and dimension limits from the plugin settings. The below screenshot displays two custom boxes with different weight capacities and dimensions. Using custom boxes, store owners can save a lot of money as they can specify the dimensions which have the least space wastage. It is very useful in packing multiple items too, as the owner can specify the weight limit that he needs for the whole package. Now you might be wondering about these dimensions mentioned in the image above. The outer dimensions are the dimensions of the parcel. These dimensions are passed to the API and are then sent to the UPS. These are the package dimensions. These dimensions are the maximum dimensions that the item should have. Otherwise, the box will not be able to contain the product. This is the weight of the parcel. It is the combined weight of the package. It contains both the weight of the product as well as the box. If you have any queries regarding the UPS shipping and parcel methods, feel free to share your ideas in the comment section below.